How many times have you said, "It's my metabolism?" That's true but why are you gaining weight? That's more complicated. Metabolism is basically the rate at which your body burns calories. Your basal metabolic rate (BMR) is the number of calories you'd burn if you did nothing all day (or the amount of calories your body needs to maintain itself in a resting state). About 75% of your metabolism is due to BMR. You will use your BMR and daily activity level (including exercise) to set your daily calorie needs for weight loss or maintenance. 1. Your metabolism will slow down as you age, especially starting at about age 30. Stay active throughout your life to maintain health and an active metabolism. 2. Gender - Men generally burn more calories at rest than women because men have more lean mass. The more muscle mass you have, the higher your metabolic rate will be. Muscle mass can be maintained/increased (and body fat decreased) throughout your life through interval cardio and weight training. Strength training also helps to keep your bones strong (preventing osteoporosis). Heredity also plays a part in your body's rate of metabolism. 3. Thyroid problems may cause your metabolism to slow down. 4. Your liver is responsible for burning much of the fat in your body. Keep it healthy by eating mainly whole, natural foods and drinking water and unsweetened drinks. If you drink alcohol, do it in moderation. Researchers from Denmark found that alcohol drinking can increase appetite. Also, when you take a drink of alcohol, your body converts a small amount of it into fat and the rest is converted (by the liver) into a substance called acetate. This acetate is then quickly released into the bloodstream and used as the body’s main source of energy. So, your body is using the acetate for energy instead of the stored fat in your body. The more you drink, the more fat your body will store (many times belly fat). 5. Get enough deep sleep each night so your body's metabolism will work right. And, if you're awake when you should be asleep, you are more apt to eat those fat-filled comfort foods. Aim for 7-9 hours of deep sleep each night. 6. No matter how fast your metabolism, a caloric surplus (consuming more calories than you burn) causes you to gain fat and weight. One surprising thing about metabolism is this: the more you weigh, the faster your metabolism will be. This happens because your body must work harder to maintain itself. That is also why it is easier to lose weight in the beginning of a fat loss/weight loss program. The overweight person's metabolism is running so high that any cut in calories will result in quick weight losses. On the other hand, its easier for that person to regain the weight because her or his body now needs fewer calories to sustain itself. 7. A slow or sluggish metabolism is not the major cause of weight gain. A caloric imbalance is the cause of weight gain (consistently consuming more calories than you burn day after day). 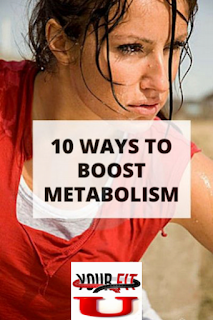 If you have a slow or sluggish metabolism? A brisk 30 minute walk each day would get you started in the right direction to speed it up. 8. Strength training (including bodyweight exercises) and cardio exercise will give you a higher metabolic rate. A combination of circuit weight training and high intensity interval cardio will keep your metabolism "revved up" throughout your life. High intensity workouts will give you maximum fat-burning and heart health benefits in minimum time. You will burn more calories and fat---during and after your workout. Exercise Post-Oxygen Consumption (EPOC) causes your body to burn more calories and fat after a tough workout. Your body has to work harder to get back to its pre-exercise state. Some of you can break through your fat loss and weight loss plateau by increasing your workout intensity. If you have been doing the same workout at the same pace for 1 month, 3 months, 6 months, 1 year or 5 years, your progress has stalled. Your body has the amazing ability to adapt to your workouts and bring your fat loss and weight loss progress to a grinding halt. 9. Sweating is not a gauge of how many calories you are burning. This may be bad news for sauna and steam room lovers. Weight loss or gain is a product of calories consumed or burned. If you burn more calories than you consume, you will lose weight and vice-versa. The best time to exercise is whenever you have the most energy. Working out at any time of the day will increase metabolism for several hours, depending on intensity (as stated in #7). Your metabolism doesn't necessarily have to slow down as you get older. Again, a combination of circuit weight training and high intensity interval cardio will keep your metabolism "revved up" throughout your life. 10. Eating smaller, frequent meals whole, natural foods will keep your metabolism "revved up" during the day. Your metabolism will slow down if there are too many hours between meals or if you are on a starvation diet. Eating certain foods/drinks such as peppers and green tea will speed your metabolism some. Actually, any food will speed your metabolism within the first hour after you eat. A high-protein food speeds metabolism for a longer period of time since protein requires more energy to digest. Your best bet is to eat small meals every 2-3 hours. Be sure and download your Free Bodyweight 500 Metabolic Fat Burner Workout Book below and start shaping your body faster! There are 3 levels: beginner, intermediate and advanced. You will also get fat-burning menus!